Grill up the all-American hot dog perfectly every time. When heated through, with good color and grill marks. 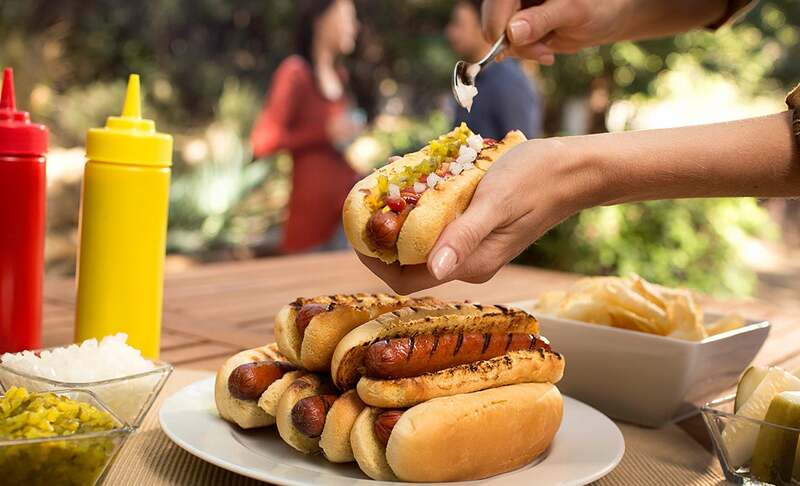 Hot dogs are the quintessential part of every American cookout. Kids love them and they can be accompanied by an infinite number of delicious toppings. They are incredibly easy to grill, but unfortunately they also incredibly easy to ruin. We’ve all seen dogs that are incinerated on one side and still cold on the other. Here are five simple steps on how to grill a hot dog that everyone from a kid to a connoisseur will enjoy. Set up your coals in a two-zone configuration. Keep all your hot coals on one side of your grill, leaving the other side empty. It’s a great way to get color and grill marks on your hot dogs, while allowing you to move the dogs to the cool side in case of a flare-up. Sear the hot dogs on the hot side. Watch them closely. Place your hot dogs directly over the coals on the hot side of the grill. Here is the important part: watch them like a hawk. Hot dogs burn very quickly. They can and do turn pitch-black in the brief time it takes you to grab a cold beverage out of the cooler. So watch them closely, and keep them moving. Set them down perpendicular to the grate. This not only creates nice grill marks, it also makes them easy to roll and rotate to avoid burning. Move to cool side to finish cooking through. Once nicely browned and covered with nice grill marks, move the hot dogs over to the cool side of the grill to finish heating. Hot dogs are fully cooked straight out of the package, so the objective of this phase is to just ensure that the dogs are thoroughly heated through. This takes approximately five to seven minutes, depending on the size of your hot dogs. Toasting the hot dog bun is an easy way to send your grilled hot dog over the top to perfection. Open the hot dog buns and place them face down on the grill, directly over the coals. Again, watch the buns closely—they burn fast, if not faster than the hot dogs. Toasting takes anywhere from a few seconds to a minute, depending on how hot your coals are. Put on your toppings and eat. Hot dogs are so popular because they are so versatile. You can top them with classic condiments like ketchup, mustard, onions, and pickle relish. Or go Chicago style with pickle spears and tomato wedges. You could even make a chili dog. Use your imagination. Think of the hot dog as a blank canvas and get creative with your toppings. If you prefer, you can simmer your hot dogs in water in a saucepan or foil pan on the hot side of the grill. Then move to the pan cool side, remove the hot dogs, and sear them directly over the coals.